Life and death are a package deal. They cannot be pulled apart and we cannot truly live unless we are aware of death. The Five Invitations is an exhilarating meditation on the meaning of life and how maintaining an ever-present consciousness of death can bring us closer to our truest selves. As a renowned teacher of compassionate caregiving and the cofounder of the Zen Hospice Project, Frank Ostaseski has sat on the precipice of death with more than a thousand people. In The Five Invitations, he distills the lessons gleaned over the course of his career, offering an evocative and stirring guide that points to a radical path to transformation. These Five Invitations show us how to wake up fully to our lives. They can be understood as best practices for anyone coping with loss or navigating any sort of transition or crisis; they guide us toward appreciating life’s preciousness. Awareness of death can be a valuable companion on the road to living well, forging a rich and meaningful life, and letting go of regret. 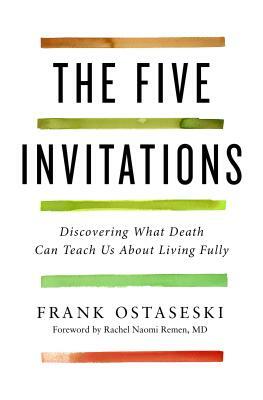 The Five Invitations is a powerful and inspiring exploration of the essential wisdom dying has to impart to all of us. FRANK OSTASESKI, founder of the Zen Hospice Project and the Metta Institute, is a Buddhist teacher, international lecturer and a leading voice in contemplative end-of-life care. He's been honored by the Dalai Lama and AARP named him one of The 50 Most Innovative People. He consults for healthcare and spiritual institutions, like the Mayo Clinic and Spirit Rock Meditation Center, and his work has been featured on programs such as PBS series With Eyes Open and The Oprah Winfrey Show, among others. “Frank Ostaseski is one of the great contemporary teachers of ancient Buddhist wisdom and practice. Over the years, his teachings have informed both my meditative and clinical practices. Now, through The Five Invitations a broader audience can benefit from Frank’s insights, soulful perspectives, and practical guidance. What a gift!” —Ira Byock M.D., international leader in palliative care, Chief Medical Officer for the Institute for Human Caring of Providence Health and Services, and author of The Four Things That Matter Most: A Book About Living and The Best Care Possible: A Physician’s Quest to Transform Care Through the End of Life. “[Frank Ostaseski] has found the space where awareness of death is revealed as a powerful elixir for living more abundantly, and he shares that secret brilliantly in this landmark book. If you want to live fully and free from fear, read it and give yourself and those who love you a rare gift!” —Robert A. F. Thurman, Professor of Religion, Columbia University, and author of Infinite Life.